Pasta Aglio e Olio aka Simple Garlic Olive Oil Linguine! So simple, so savory, so good. Simple good family like this pasta with garlic and olive oil for a Sunday night makes me happy. Sharing a huge bowl, family style, is how things are meant to be. Breaking bread this way feels right. I love sharing these good simple foods with my family. Especially when we have a little something special like raw milk real Parmeggiano Reggiano from Parma Italy. We very much enjoyed that little treat with this very simple meal. It’s made in under twenty minutes with quality and easy simple ingredients. What’s not to love about that? We are still keeping things low key around here, and later this week I’ll be joining my Mama at my brothers for my nieces birthday. A time to eat, relax, and enjoy each other. Oh and eat In n Out, and I’ll for sure be making this meal for the family while I am there. I’ll have my niece assist in this, she loves being in the kitchen with me, at least for short bursts of time. 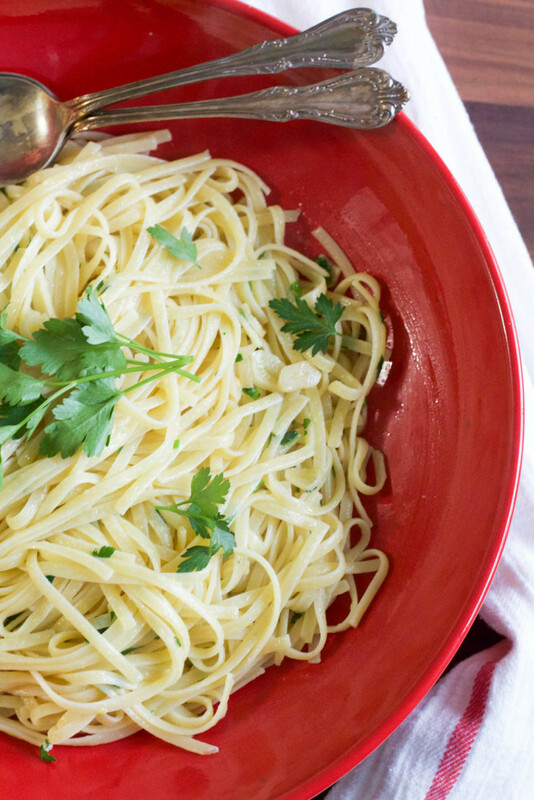 Simple Garlic Olive Oil Linguine is super easy so make it tonight! 1. While the pasta is cooking, place olive oil in a large skillet over medium heat. Cook the garlic for 5 minutes, or until slightly browned. Add the cooked pasta and toss to combine. Turn off heat. Add 1/2 cup pasta water, 1/2 teaspoon fine sea salt, 1/2 teaspoon pepper, parsley, cheese, and lemon juice. Toss to combine. Serve immediately with more parley and cheese if desired. Store leftovers in an airtight container for up to 3 days. Lemony Pasta with Smoked Salmon and Dill from Shockingly Delicious. Lamb Bolognese from Nutmeg Nanny. Baked Mac and Cheese from Poet in the Pantry. 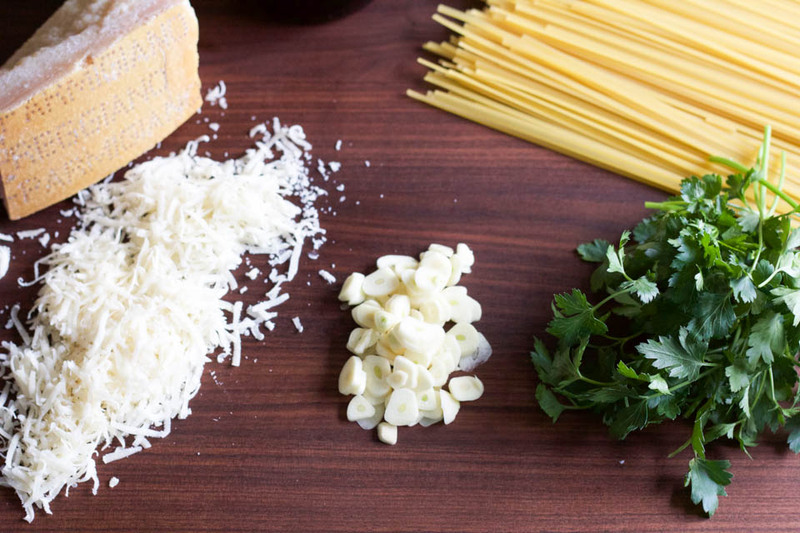 Some of the best pasta dishes are the simplest – love this recipe! This is one of my go-to pasta dishes during the week. So simple, but such bold flavor! Yum! I love simple and this really is classic, easy, comfort food. Lunch is coming soon, I’m thinking pasta! Sometimes simple is just better! I love simple flavors the best–when the ingredients are great you don’t need to dress it up with a bunch of sauces! The photos make me want to dive into this bowl (though I’ve never tried In ‘n Out so I’d hit that too)! Thank you very much, Kristen! In n Out, it’s a nostalgia thing. Not that it’s the best burger in the world, it’s just a very good fast burger. I love a good simple pasta. I mean, I even love plain buttered noodles. So this? This is great. Aglio e olio is a staple at our house! So simple and good. Yay! 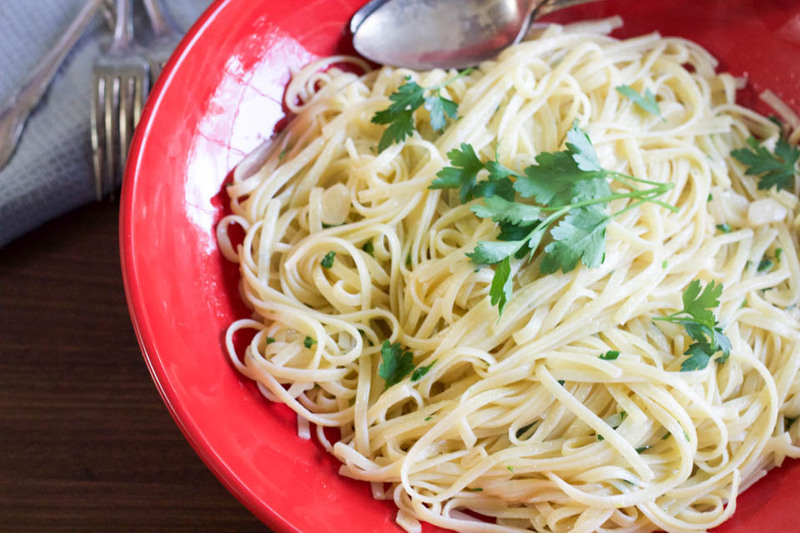 Oh yes, your simple pasta dish is the best! Sometimes the dishes with the fewest ingredients, prepared most simply, are absolute perfection. Thanks for linking to my Lemony Pasta with Smoked Salmon…I had forgotten about that one, and now you have me craving it again! Aw, thanks for including my Mac & Cheese! And THIS! This is one of my favorite comfort foods. Simple yet so satisfying. And highly addictive! LOVE!!! My pleasure! It looks sooooo good, comfort food at it’s best.